Banner art, above, was designed by Alice Debo, using art created by OBA members. Members gathered on November 10 for our most recent bi-annual meeting at Mary McCarty's Community Center in Milwaukie, Oregon. ​Several members shared their completed sketchbooks from round 2 of our sketchbook exchange. Round 3 is being coordinated by Marilyn Lindberg, and will begin in early 2019. We discussed future group shows, including the Cannon Beach exhibit in spring of 2019, and the Lan Su Chinese Garden show in fall of 2019. Much of the meeting was devoted to instructions and demonstrations involving our next group project: a journal featuring illustrated letters. Several members brought the practice sketches they created to help us decide on the best format for the project. Alice Debo revealed the final consensus and explained instructions for the format. Laura Shea presented a demonstration with helpful suggestions for creating illustrated letters. We spent the remainder of the meeting practicing illustrated lettering with plants and letters provided by Laura. 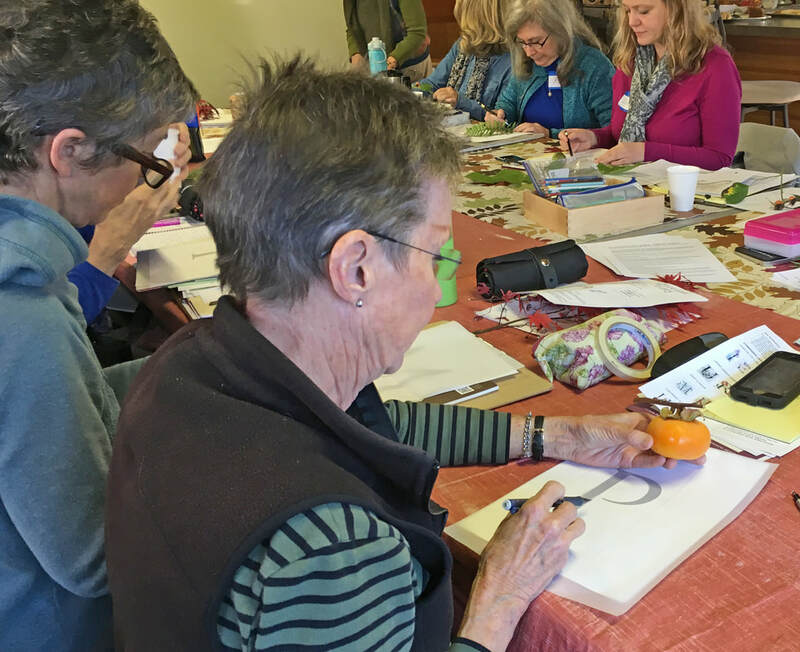 Above, OBA Members hard at work practicing for our illustrated letter project during our November 2018 bi-annual meeting.